Diffused Illuminated 10x magnification with 14 bright LED lights allows you to focus in on a specific section of your face – ideal for makeup applications, precise tweezing and spot removal. The natural daylight LEDs provides extra lighting during your makeup routine for a professional-looking finish. It has a flexible 360° rotation with a powerful locking suction cup to provide a secure attachment. It’s fully adjustable to any desired position. The mirror itself measures 5 inches (12.7cm). The circumference of the mirror (including the frame) is 6 4/5 inches. When the mirror is stood up straight, the total height is 8 inches (20.32 cm). It operates using 3 AAA Batteries (not included), and can be folded down for easy storage. Please note: The magnification mirror is a concave mirror so you need to be close to the mirror to achieve the maximum effect of amplification. 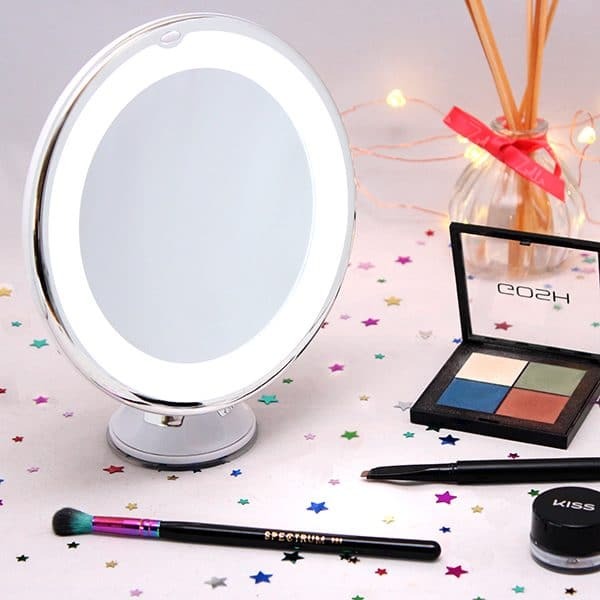 Accentuate the positives – This LED makeup mirror comes with a large 12.7 cm wide clear glass screen. The 10X magnification allows you to really zoom in on even the smallest details on your face so you can highlight your best features. It’s perfect for applying make up such as eyeliner, mascara and brow products, as well as tweezing unwanted hairs and squeezing spots. Illumination – This makeup mirror is 30% brighter and uses 60% less energy than incandescent bulbs. The mirror is equipped with energy-efficient daylight LEDs that will brighten your face and provide you with natural daylight so you can look your best. Innovative locking – The easy-lock suction cup allows you to securely attach the mirror on another mirror or any other flat surfaces in your home. It takes no more than 5 seconds to install this mirror; you simply hold it down onto a flat surface and twist it to lock the mirror in place. Portable – You can easily detach the suction cup with a simple twist to move it anywhere else. Take it with you on your next trip as it takes up less than ½ sq ft. in your suitcase. 1. This mirror requires a clean, flat and smooth surface of at least 9×9 cm for the suction to work. 2. The mirror will adhere to surfaces such as ceramic, marble, acrylic, porcelain, enamel, and other mirrors. 3. The mirror won’t stick to surfaces such as stone walls, wood, wallpaper or textured walls. I recently purchased one of these mirrors from Holly and I can honestly say it is amazing. I can actually see so much better when I’m applying my makeup (and I mean every single eyelash!) as it has a 10x magnification. The LED light is also a fab bonus as it gives a white light, especially handy if natural daylight is a problem. I do think my makeup has improved, especially my eyeliner, as everything is so much clearer when I use this mirror compared to my normal hand held one. It’s lightweight, so easy to hold, but the mirror is also really sturdy and along with the suction cap it stands in place on my dressing table. It’s not too bulky and simply folds away, so I was able to take it on holiday with me. I love that it rotates 360 degrees making it so much easier to get a better angle for really precise jobs like plucking my eyebrows or applying gel eyeliner. 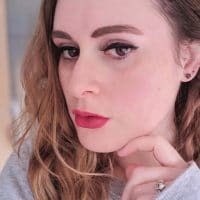 This mirror is worth every penny and I’d totally recommend it to any beauty lover!